Useful information about Cambodia for your perfect vacations! Cambodia, or the Kingdom of Cambodia, is located in the Indochinese peninsula, between Vietnam (to the East), Laos (to the North) and Thailand (to the West). The country occupies 181,035 km2 and has a coastline on its southern part of 443 km on the gulf of Thailand. Cambodia has a population of more than 14.7 million inhabitants divided into three major ethnic groups. The vast majority of the Cambodian population is of Khmer origin with 87% of the total population (a large number of Khmer people are Chinese or Vietnamese origin). With 5% Vietnamese immigrants and about 3% Chinese immigrants, the rest of the population is a mix of different ethnic groups that have migrated after the troubled times of the 20th century, such as the ethnic groups like the Chams, who are the only muslims in Cambodia, and other ethnic groups such as the Brao, Kravet, and Mnong. During the 20th century, the largest tragedy of Cambodian history happened with the genocide of 1.7 million people (out of a population of 7.5 million at the time) by Pol Pot's Khmer Rouge regime that reigned over the country from 1975 to 1979. The vast majority of Cambodian people are of the Buddhist religion with an estimated 97% of the population. The other religions are Islam, with less than 2% of the population, belonging exclusively to the Cham ethnic minority group, and Christianity with less than 0.5% of the population. The kingdom of Cambodia is a Constitutional Monarchy in which the king, currently His Majesty Norodom Sihamony, appoints the Prime Minister, currently Mr. Hun Sen from the Cambodian's People's Party, with whom together constitute the executive power. The legislative power is divided into the National Assembly, where different parties represent people's interest, and the Senate. These two bodies make up the Parliament and propose and vote for laws as well as control the government. Judiciary power is given to the Supreme Judicial Council, supposedly separated from the executive power, even though it is not the truth as the executive power uses the Judiciary power to control its opponents. The capital of Cambodia is Phnom Penh, with 1,325,681 inhabitants. 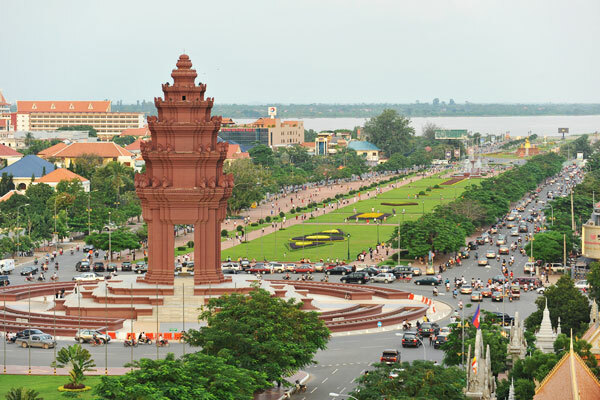 Phnom Penh is the largest city in the kingdom of Cambodia while other cities are much fewer, such as Battambang with 196,000 inhabitants, Siem Reap with 148,000 inhabitants and Sihanoukville with 94,500 inhabitants. Where is located Cambodia's the most well-known place? The country is well-renowned for being the origin of the Khmer Empire that once stretched from parts of current days Thailand, Laos and South Vietnam. 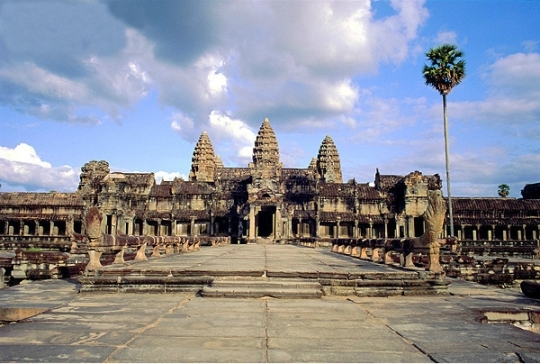 The Khmer Empire lasted from the 9th century to the 15th century and its main site is the Angkor temples complex located outside the city of Siem Reap. The Angkor temples site used to be the center of Khmer Empire and a megacity with a primary sector that could have supported up to one million inhabitants. The area has been designated a UNESCO World Heritage site and is the main attraction of the country. Other famous places are the Tonle Sap lake (or Great Lake), which is as much a lake as a river, because during half of the year, during the dry season, its flow is so low that the lake is only a river. The Tonle Sap River drains into the mighty Mekong River at Phnom Penh from November until May. During the rainy season, from June to the end of October, the level of the Mekong River is high and the Tonle Sap river level rises and flows into the Tonle Sap Lake, that can then reach a capacity of 73 km2! Another interesting aspect of the Tonle Sap River is that the flow of water changes direction at the beginning and the end of the rainy season. These two destinations, protected by UNESCO, are the main attractions of Cambodia for lovers of nature and culture, while Phnom Penh, with its colonial culture heritage, and Sihanoukville with its sandy beaches and turquoise waters, also attracting numerous travelers. The weather of Cambodia reflects the region where Cambodia is located. The weather of Cambodia is somewhat similar to the weather of South Vietnam, with two seasons; a dry and warm season from November to May, and a rainy and warm season from June until the end of October.